Beatrice Ohanessian is a woman of many firsts. She was Iraq's first concert pianist. She was the first ever Iraqi female composer. She performed with the Iraqi National Symphony Orchestra for three decades. Now she makes a quiet living teaching piano from her home in the Twin Cities suburbs. Edina, Minn. — Beatrice Ohanessian sits at an upright piano, her hands darting across the keyboard with remarkable agility. She lives in her Edina rambler with her sister. The floors and walls are covered with rugs and tapestries; the fireplace mantel is covered with pictures of her parents and her older brother, who's now in a Minneapolis nursing home. Ohanessian complains that her playing is terrible - she's out of practice these days. But she remembers when she was a pioneer in music. Ohanessian was born in Baghdad to Armenian parents. Her mother and father both fled the Armenian genocide in Turkey when they were young. Her father got a job as an accountant for an oil company. The family lived well and Beatrice's parents encouraged both her and her siblings to study music. Beatrice immediately took to the piano. "My dream was just to go on and on however much I could do in piano - in piano playing," says Ohanessian. Beatrice was born just as Iraq was developing a deep interest in the arts and culture of the western world. She was in elementary school when it established an Institute of Fine Arts in 1938, and she applied for admission a couple of years later. She was at first turned down as too young, but a Romanian piano teacher saw her perform and took her under his wing. By the age of twelve she was performing weekly recitals at the national radio station. "My father would take me by the hand and walk me to the broadcasting station," says Ohanessian. "There I would give a program of 15 minutes which is what my professor arranged for. I'll never forget how I trembled when the green light went on - that I will never forget!" Ohanessian says while her parents were very supportive of her playing, many neighbors looked upon her pursuit of a professional career as inappropriate for a young woman. Still she persisted. The government created a performing arts scholarship, which allowed her to study at the Royal Academy of Music in London. From there she went to New York to study at Julliard. She travelled to Salzburg for summer classes. Finally she returned to Iraq in 1961 and became principal concert pianist for the Iraq National Symphony Orchestra. She held the post for over thirty years. She keeps cassettes from those performances, some with long silences from when the power went out in the concert hall. Ohanessian took a break in the 1970's to teach at the University of Minnesota and Macalester. In all this time she never intended to become a composer. Then Iraq went to war against Iran. "It was the very first time in my life that I saw Iraqi soldiers marching to war," says Ohanessian. "This was something very strong and shocking. It just moved us; we didn't know what to expect, what was next." Beatrice took that emotional upheaval and turned it into music: tributes to soldiers, waltzes, and an overture to Hammurabi, the creator of law in Babylon. She toured from one cultural center to another, performing for - amongst others - French President Jaques Chirac. She became a sort of cultural ambassador herself, often creating friendships where politicians would fail. "For instance I would make an all French program, an all Spanish program, all American composers, or Swedish," she says. "So these people representing their countries appreciated this. They appreciated what I'm doing and they appreciated that I appreciated their music and that I made an effort to introduce their music to our public." Ohanessian says she knows only of two evenings when Saddam Hussein attended her performances. On other occasions he would send a representative. She shook his hand once, and he congratulated her on her playing. She says he supported the arts. "Not everything...not everything," she says. "But a few things, yes. We'd say best is just to continue in our work and not meddle in politics, so that's the way we lived." Beatrice Ohanessian's years performing for and mingling with ambassadors has taught her amazing diplomacy. She expresses concern for the war in Iraq, but without placing blame on any one side. She says she has such affection for both Iraq and the United States that it's hard to watch what's happening in her native country. More than anything, though, she is grateful for the life she's been given. "I always was lucky enough to do what I wanted to do," she says. "Perform abroad in Europe... I was able to travel, perform and come back. Nobody told me never to go. Nobody refused me visa to get out of the country. They were proud to stamp my passport and send me out because they knew that when I went abroad I was taking something from Iraq to that country where I was going. Something like music. Something nice!" After her parents died, Beatrice and her sister finally moved to the United States in 1994 to be with their brother, who's lived here since the 1950's. Beatrice was not able to bring much with her. Her most precious souvenirs are the old programs and medals from her performances. She left behind her Steinway piano with a friend. 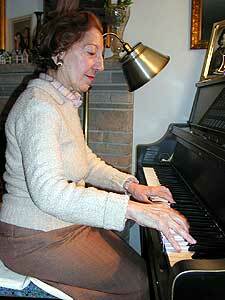 Now Beatrice teaches piano at the University of St. Thomas and gives private lessons at her home.